Christy Baker, of Christy B Fitness, is a Health & Fitness Coach and is ready to grow her business. Baker recognizes that it is time to put a focus on marketing. She also recognizes that success needs a strategy and a plan. All new entrepreneurs, like Christy, wear many hats. In doing so, some of the details of marketing and branding can get set aside. 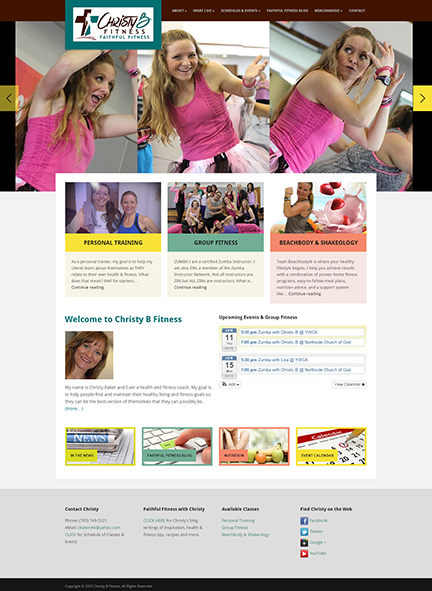 A new logo, promotional materials, website (www.ChristyBFitness.com), and a strong social media initiative have been set in place to assist Baker in her business goals. “In my work with Beachbody, one of the leading fitness and nutrition companies in the world, I promote fitness and a healthy lifestyle through nutrition counseling, personal training, and group fitness classes. I have been given the gift of being able to share my continued health and fitness journey while I help others,” said Christy Baker, Owner of Christy B Fitness. Christy B Fitness partnered with Muncie, Indiana-based marketing firm, McCormick-Dishman, LLC, to develop the company’s new brand identity. “The new website has quickly become a hub of information for all things Zumba, Personal/Corporate Wellness & Beachbody information in Muncie, Indiana. It’s a one-stop location of information, FAQs and up-to-date class offerings,” said Tracy Dishman, CEO/President of McCormick-Dishman, LLC. “The website, partnered with a social media strategy sponsorship with The Blue Zone, Inc., allows fitness and health information to be everywhere the customer may be looking for it,” said Dishman.